Since 1954, REL have been the industry leaders in commercial refrigeration, providing bespoke cooling solutions for our many valued customers. Since our establishment, the company has gathered core competencies and extensive experience across a vast range of industries including hospitality, retail, healthcare and educational. Our expertise allows us to offer the full range of services, from the initial design phases, to installation, and then to service and maintenance. Choose from a selection of premium quality brand products- whether it be bottle/keg coolers, cold rooms, or display refrigeration, REL will find the solution that suits you. Our extended divisions include Bar Solutions, Facility Management and Renewable’s. Operating out of 32 Counties of Ireland, Our focused team of experienced professionals will provide you with honest advice and support to allow you to make the decision process easy and hassle free. Our Professional design and planning capabilities will ensure your enterprise is structured to maximize efficiency and productivity. Our team will endeavor to ensure our offerings are in line with the ever changing trends that are occurring in the marketplace. We provide exclusive distribution of some of the world leading brands. 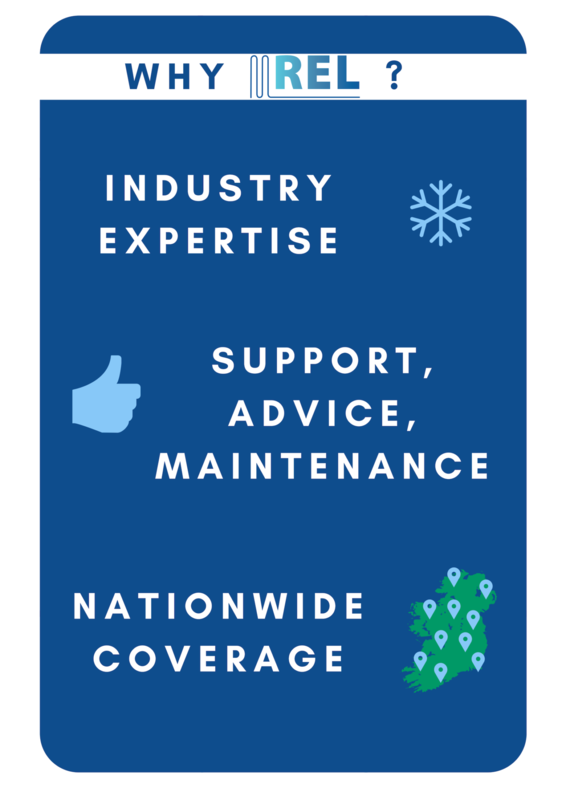 Our ‘Total Care’ Preventative Maintenance packages will ensure that your Installation will provide many years service and we can advise on what would be best suited to you or your client. Whether you are an Architect, Consultant, M&E Contractor, company or individual proprietor the REL team can supply the total package at the most cost effective price. We can offer premium or mid range equipment in each category and we source equipment globally to ensure you get the best pricing and quality every time.